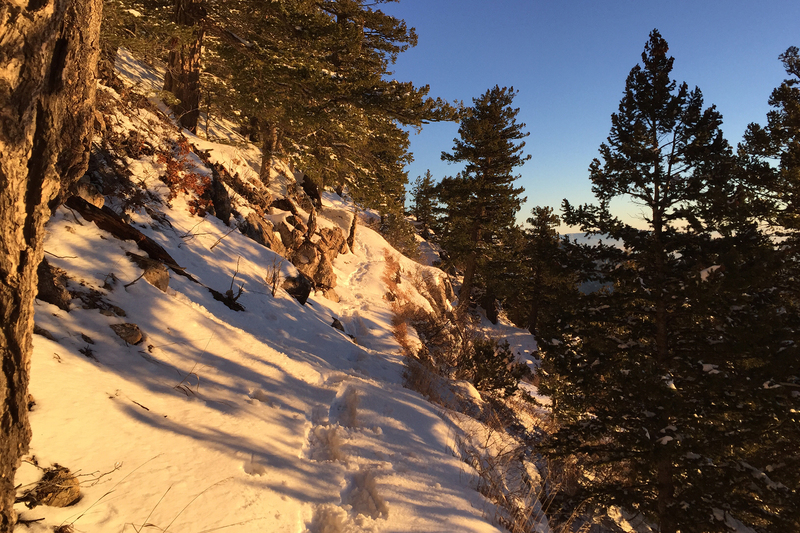 Late Thursday afternoon as the last vestiges of the latest snow were clearing the area I thought about riding the tram up to the summit to get some photos in the late afternoon sun. The only problem was that other than the summit, all of Albuquerque was bathed in sunshine. The peak was socked in with a layer of cloud that would just not dissipate. 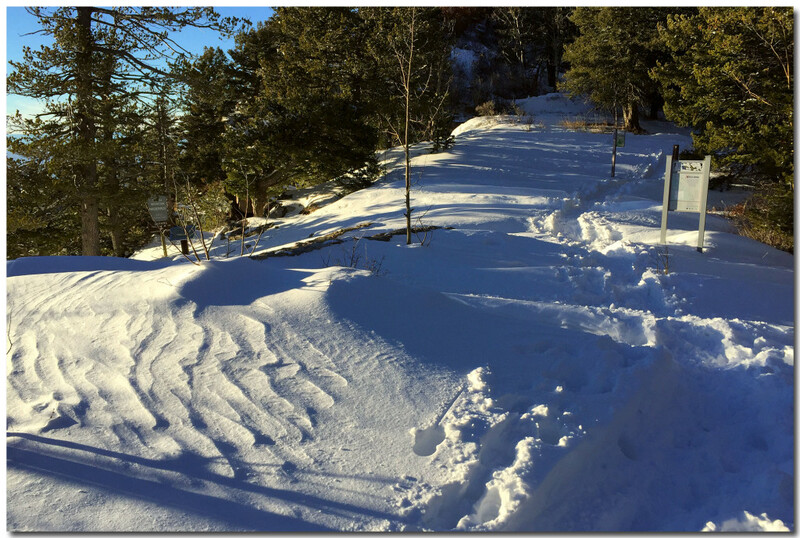 I had a full morning schedule so by the time late afternoon rolled about I was ready to try my snowshoes out on what was supposed to be 8 to 10 inches of fresh snow. 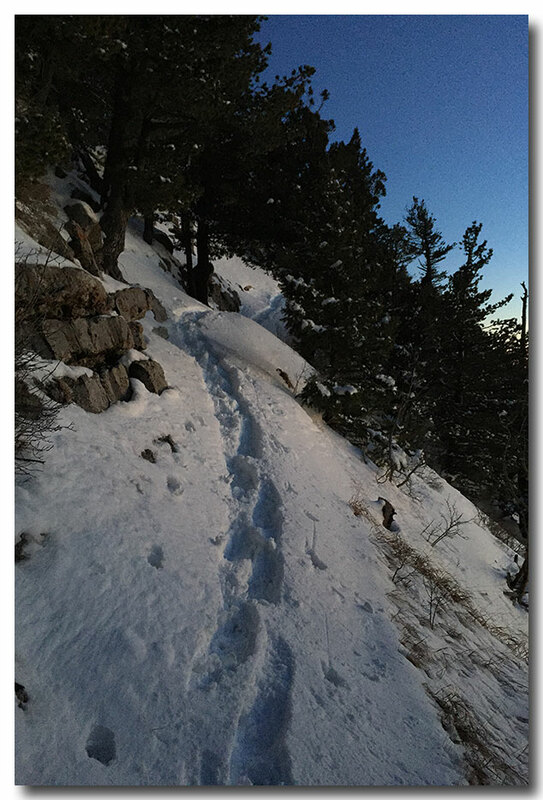 As you can see in the image above, the sidewalk is completely filled with something like 3 feet of drifted snow, while a couple of hundred feet away on the exposed ridge there was no snow at all. The boundary sign that marks the start of the connecting trail to the Guest House about two miles away is in the middle of the image above, and on the left of the one below. 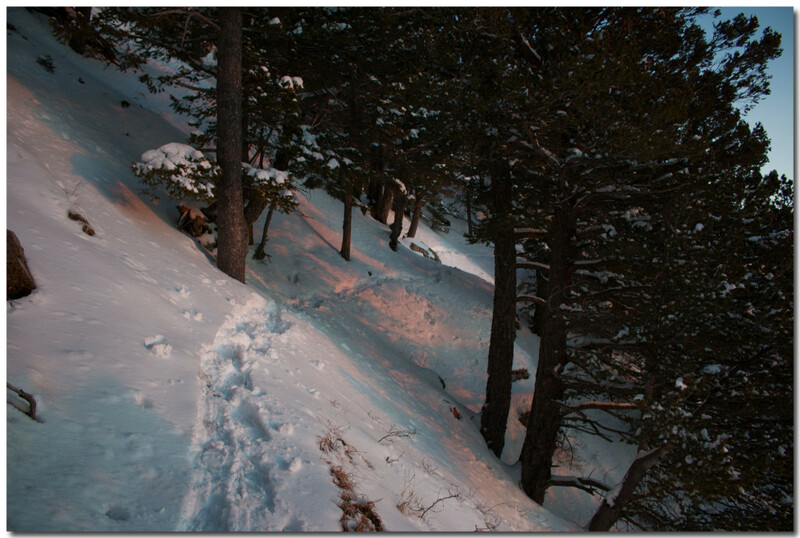 Someone has broken a trail into the woods in the second image, but since that is a sheltered path, I was pretty certain that it would already be packed down and well trodden. I chose the connecting trail with its open exposure and great views. 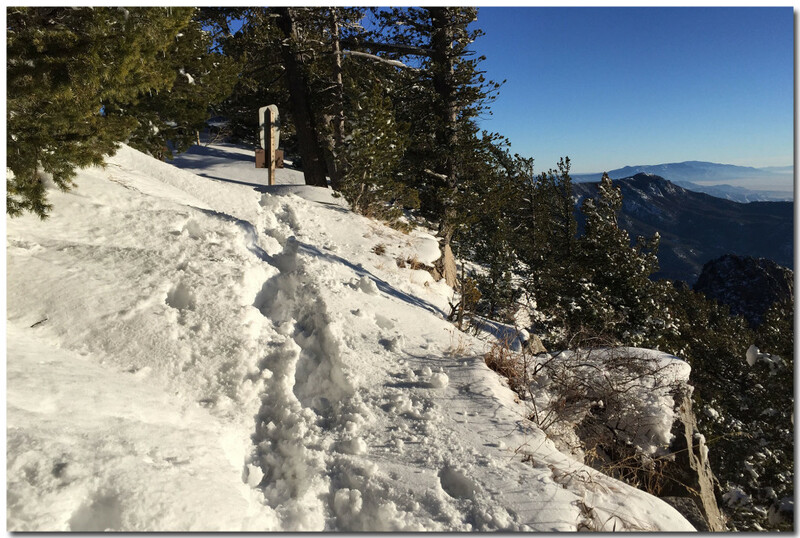 After a quick slog through a couple of one to two feet drifts, the trail became more exposed and the snow depth dropped to somewhere between 6 to 8 inches. The connecting trail generally faces either south or west and is either exposed or open. On the southern exposed faces, the snow melts the fastest, and in fact there was a section of slush between these two images. The great thing about hiking this day was the 32 degree temperature and the absence of wind. I was able to ditch the hat and gloves which made all of the camera work so much easier. 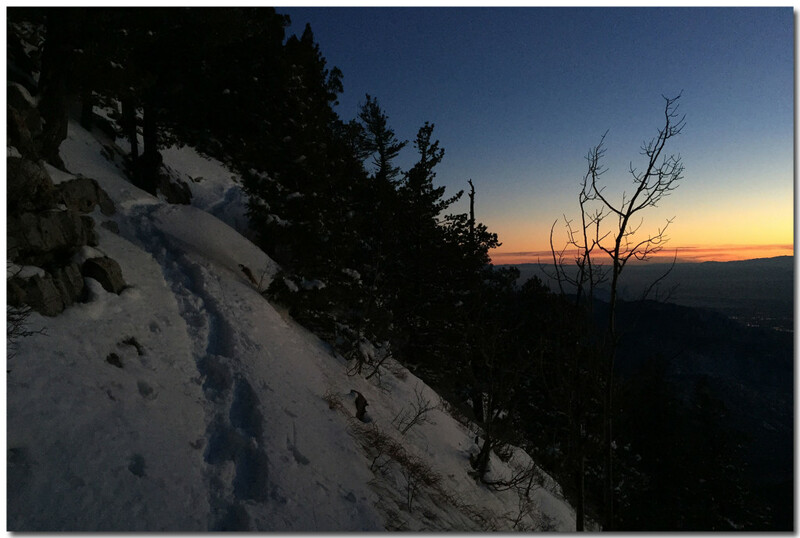 I use MSR EVO ascent snowshoes, picked especially for the upper reaches of the La Luz trail and the trails around the summit. 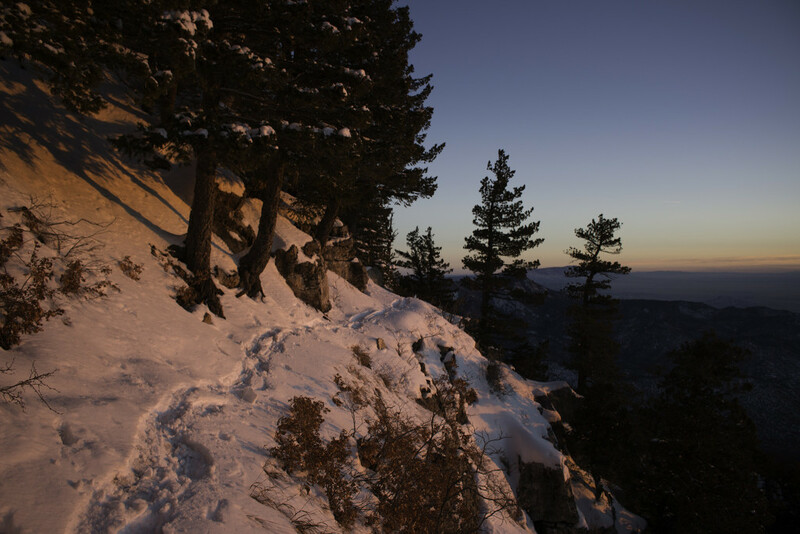 Considered climbing snowshoes, they are equipped with steel rails underneath as well as having a crampon brake. 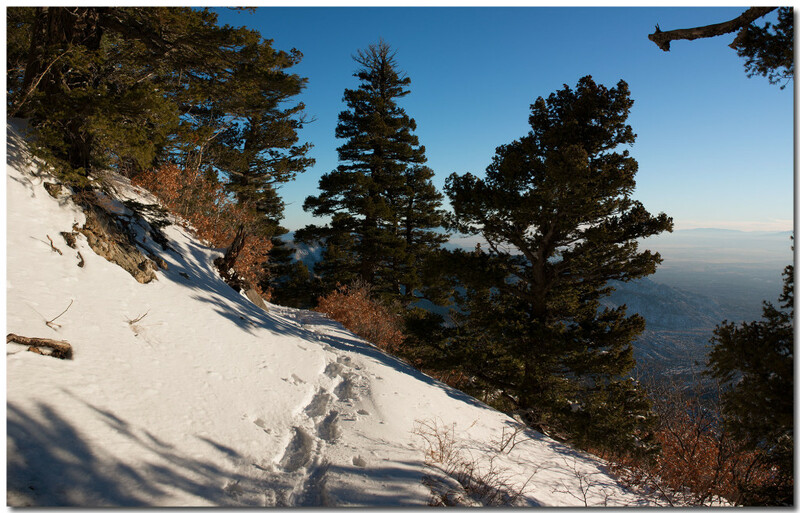 For hiking on snow that is subject to the freeze-thaw cycle, and climbing steep pitches, they are great. 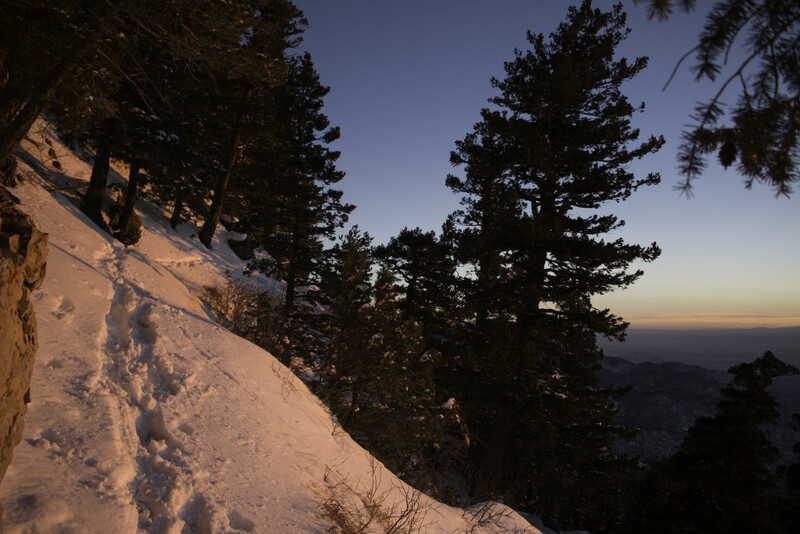 One of the objectives of this trip was to photograph the snow in the last light of the day. Known generally as the golden hour, in New Mexico, especially at this time of year, it’s more like the golden half hour, if even that. Sunset was somewhere around 5:22 and the first golden light showed up on the mountain about 5:08. The difference between these two images is subtle, but the bright white afternoon show is starting to change color. 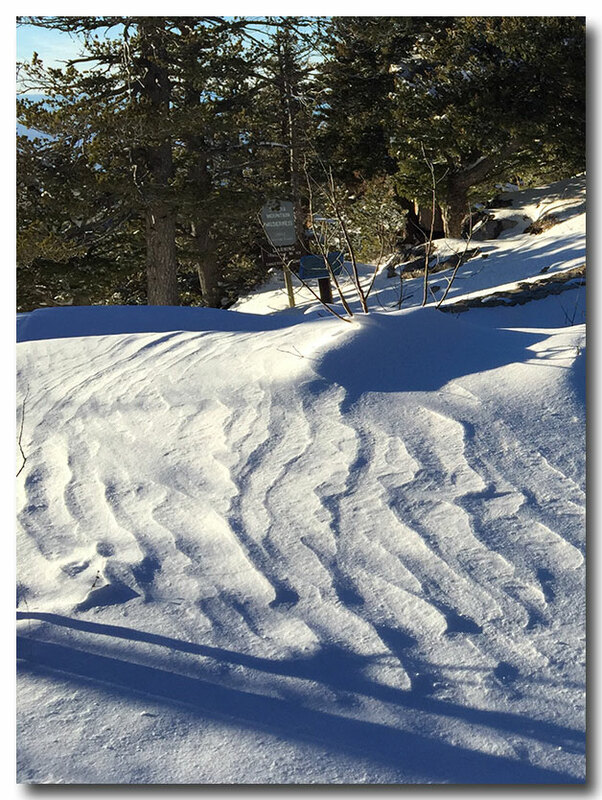 Not only does the snow reflect the golden color, but so do the rocks and the ponderosa pines, espcially when the light hits them just right. 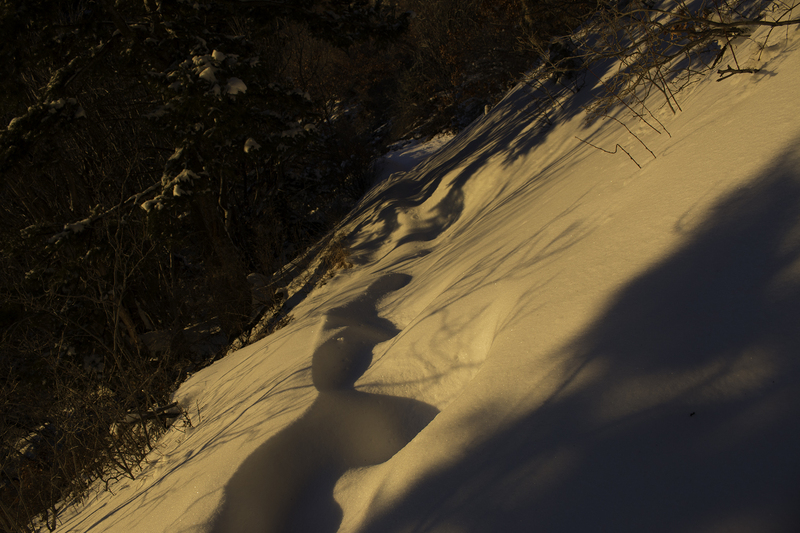 Because I knew the light was fading fast, I stopped at this section of unbroken golden snow, grabbed a couple of images and headed back for the tram. 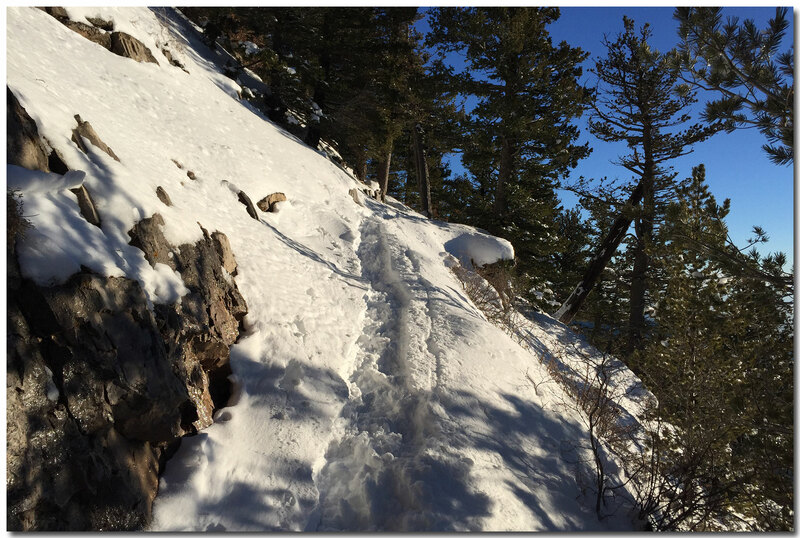 I had only broken the trail for half a mile out, but at 10,000+ feet in elevation, I had already had a pretty good workout. It was 5:14 and the deepest gold was reflecting off of the mountain and soon I hoped, it would turn pink. It is said that the mountains get their name from the Spanish word for watermelon, Sandia. In the next several images you can see that the sun has almost set, and thats when the pink rays light up the mountain. Granted, the felspar that is in the rock also reflects some of the pink light, but I find that the best time to experience the show is when it reflects off of freshly fallen snow. The last dash of pink disappears from the mountain just after 5:27. At this time of year you have 5 minutes to get your shot, so you better be where you want to be, because you certainly don’t have much time to work with. That’s why I turned around where I did, because I knew that I did not want to be stuck in a section of the trail without any exposure. The pink may be nice, but it does not really penetrate the forested slopes. I knew that I could make a bit better time on the way back, since I had already broken the trail on the outbound section. As you can see, the slope here is sometimes 45 degrees and there is not always a whole lot of space to work with. You don’t want to be in a hurry on a steep slippery slope. It is only 5:47, only 20 some minutes after sunest and darkness is spreading rapidly across the mountain. I had timed the last section of my slog back by the sound of the tram as it made its way up the mountain. You can hear it slow as the trams cross the second tower which indicates that you have maybe 7 minutes to get to the building to board the next one down. The only problem for me was that as soon as I arrived, it was announced that the next tram would not board for 15 or more minutes. I took the extra time to catch an image of Venus over Albuquerque. This entry was posted in Albuquerque and Environs, Hiking, Landscapes of New Mexico, Snowshoeing in New Mexico, The Sandia Mountains, Winter Hiking in New Mexico and tagged Golden hour in New Mexico, Sandia in the Sandias. Bookmark the permalink.